We can expect an increase in extreme weather events as greenhouse gases change the climate. From searing heat and drought to powerful storms, Manitobans will be spending more time and money picking up after wild weather. Climate change will affect the frequency, severity and duration of extreme weather events (1). A roof-ruining, car-smashing hailstorm every twenty years is both memorable and tolerable. The same type of storm every five years would tax our patience and our pocketbooks. The Canadian Prairies are well known for spectacular thunderstorms. Thunderstorms often generate destructive winds. Tornados are the most infamous and deadly of these. However, straight-line winds are more often the cause of significant property damage and create dangerous conditions for anyone caught outdoors. Straight-line winds are generated when a downward rush of wind – a microburst – is released from a thundercloud. Once airflow reaches the ground, it spreads horizontally with tremendous energy. Strong straight-line winds can peel shingles off roofs, blow out windows, push mobile homes and cottages off foundations, and force moving vehicles from roads. Straight-line winds can exceed 160 kilometres an hour, making them as dangerous as hurricanes and F1 tornados. The power of straight-line winds has been felt in Manitoba. In 1996, a thunderstorm accompanied by winds reaching 120 kilometres an hour toppled 19 hydro transmission towers north of Winnipeg. Each tower weighed three tons, and the subsequent damage threatened a massive blackout in the city. Manitoba Hydro was forced to buy power from the United States while crews repaired the lines (2). 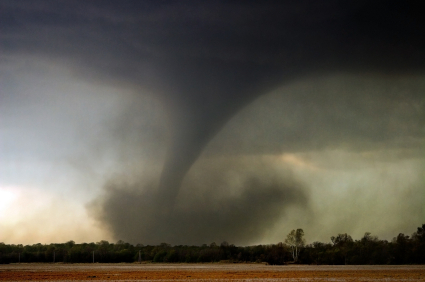 Tornado activity may increase as the climate changes. Manitoba’s tornado season normally runs from May to August (3). Although tornadoes are most common in the southern areas of the province, they have been seen as far north as Thompson. The same processes that will make windstorms more common may spawn more twisters as well. Thunderstorms and their destructive winds are expected to become more frequent and severe as our climate changes (4). Longer, hotter summers will generate warmer surface temperatures, causing the air to become more buoyant. Air, laden with moisture from increased evaporation, will rise into the atmosphere more rapidly and more often. Manitobans will have to prepare for the dangers and losses associated with these recurring intense windstorms. Hail consists of small balls or larger pieces of ice (hailstones) with a diameter ranging from 5 to 50 mm (5). They can grow greater than ten centimetres in diameter. When driven by high winds, hailstones can hit the ground at a deadly 130 kilometres an hour. The largest Canadian hailstone fell in Cedoux, SK. It measured 11.4 cm (4.5″) in diameter and weighed 290g (0.55 lbs). A softball is 10.2 cm or 4 inches in diameter. Of all the extreme weather events, hail causes the most economic losses in property and crop damage. Fortunately, Canada has never recorded a human death from hail, although livestock, pets and wildlife have not been as fortunate. Winnipeg and the southwest portion of the province have hosted the most dangerous Manitoban hailstorms. On July 16, 1996, a hailstorm causing over $100 million dollars damage pockmarked vehicles, smashed windows and ruined roofs (6). It was the worst single disaster claim against the Manitoba Public Insurance Corporation in its 25-year history. Fortunately, no one was seriously injured. Climate change models are predicting more severe hailstorms for Manitoba as greenhouse gas levels increase in the atmosphere. 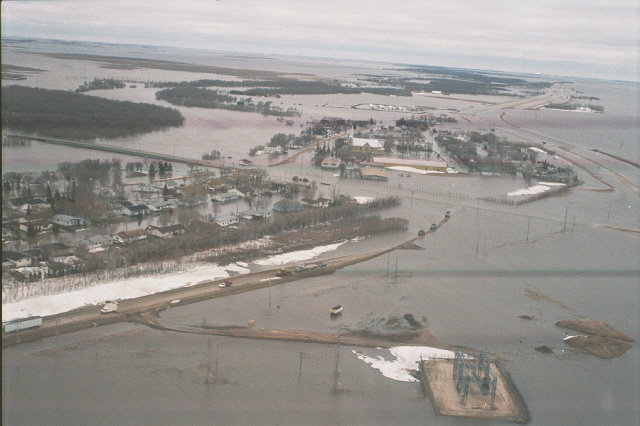 In 1997, the Flood of the Century forced thousands of Manitobans to flee their homes in the Red River Valley. Rural Manitobans were hardest hit. Almost 22 000 people were displaced from Emerson, Rosenort, Morris, St. Jean Baptiste and many other towns and surrounding communities. At least 6000 people were evacuated from Winnipeg. An estimated 2500 homes were damaged, and about 100 other were totally destroyed. Two hundred thousand hectares of farmland were flooded. Damage was estimated at $500 million for Manitoba, and $4.5 billion in North Dakota (7). Not included are the values of heirlooms, photographs and other emotionally priceless objects. If the floodway protecting Winnipeg had been breached during the 1997 flood, losses would have totaled over $7 billion (8). Floodwater causes problems far beyond property loss. Floodwaters and storm waters can carry 1000 times the normal amount of disease-bearing microorgranisms, as well as pesticides, metals and other pollutants (9). There are over 120 types of viruses from human and animal waste that can be spread through water, including insulin-dependent diabetes and meningitis (10). Flooding is a part Red River Valley history. Tree rings have provided scientists with glimpses into the hydrological past of our province as far back as A.D. 1286 (12). Tree ring data suggests that climactic changes are intimately tied to the frequency and destructiveness of flooding in the Red River Valley. Research results from the Red River’s sister, the Mississippi, is troubling. Even small changes in mean temperature and precipitation cause disproportionately larger increases in the size and frequency of floods on the Mississippi (13). Global Circulation Models predict more extreme climactic events, including greater springtime and winter precipitation for the Canadian Prairies (14). If the Mississippi is any indication of the flooding to come, Manitobans should keep their sandbags ready. Climate change scenarios predict longer, hotter summers across the Prairie Provinces. Spring would arrive earlier, summer would last longer and heat waves would be more common. Living in Manitoba, more heat might seem like a good thing! However, long, uninterrupted heat waves are hard on crops and livestock and potentially dangerous to people. Climate change will have a major impact on agriculture in Manitoba. Increased temperatures may exceed optimal conditions for crop growth. In the same way that overheated people become sluggish and unproductive, plants respond with a steep drop in net growth and yield. High temperatures also accelerate development, resulting in early maturation and reduced yield. Climate change models predict 10 to 20 percent declines in summer precipitation in Manitoba (15). What rain does fall will more likely be released during intense weather events. The duration of dry periods between deluges is predicted to increase (16). Coupled with warmer temperatures, Prairie farmers can expect more droughts (17). Evaporation, runoff and soil moisture will also be influenced by climate change. Warmer temperatures will increase the rate of evapotranspiration, draining both the soil and crops of water. Wheat, corn and soybeans are very sensitive to moisture stress – particularly during flowering, pollination and grain-filling (18). A greater demand for irrigation would place a strain on limited water supplies. Livestock are also be more susceptible to the effects of high temperatures. Heat stressed dairy cattle produce less milk and are less fertile (19). Hogs and fowl are especially susceptible to heat-related injury and death because they have no sweat glands. The demand – and cost – for water and cooling systems will grow. A heat wave is a period of abnormally and uncomfortably hot weather with more than three consecutive days of maximum temperature at or above 32°C (20). They are more difficult to bear for city dwellers because the very materials and design of urban architecture trap heat (21). When carbon dioxide levels in our atmosphere double as predicted, Winnipeg can expect almost 40 days every summer with temperatures above 30°C (22). This will be over triple the number of average hot days of summers between 1951 and 1980 (23). Natural landscape features – such as trees – reflect heat and actively cool the air by evapotranspiration. In urban areas, they have been replaced by buildings and paved surfaces. The brick and concrete that that make up much of a city’s surface have high heat conductivity and storage capacities (24). Solar radiation is stored in these materials as heat (25). This produces the urban heat island effect. Daytime differences between rural and urban temperatures can range as much as 7 degrees °C. A pleasantly hot 29°C day in Winkler or Dauphin would be a wilting 36°C in Winnipeg. Hot days do not pose the most serious threat to Manitoban urbanites. It is the lack of relief at night that puts people in serious danger (26). Heat trapped in concrete building and streets is released at night. City temperatures stay uncomfortably high and potentially deadly even when the sun goes down. Without nighttime relief, the human body can succumb to the stresses of intense heat. Among all natural hazards, including lightening strikes, tornados, floods and earthquakes, prolonged periods of extreme heat produce the highest death tolls in cities (27).